It started when I was young. My Dad’s job was really hard for me to understand, let alone try and explain it to others. He was a ‘Drilling Manager’, for Imperial Oil whose main consumer facing brand, in Canada, is Esso. I knew I had it wrong when my friends asked if he worked at a gas station. Sigh, no. Then it was my turn. I graduated design school and moved into one of the tinier niche sides of the apparel business in Western Canada, which is already quite small. I was a Product Manager for outerwear, mostly. This role is involved with all facets of creating a product and in the apparel world, particularly the sporting goods industry, this job title is well known. But, try to explain that to someone on an airplane and I mostly just called myself a designer. So much easier to understand. My husband doesn’t have a tricky job title, but what his company does is a mouthful. Plan B Energy Storage designs and manufactures large format lithium ion batteries for hybridizing heavy industry. Just the other day, I was on a plane and sitting beside a sea captain, the industry my husband’s company is strong in. He had never heard of batteries like this and was quite intrigued. But, I quickly ran out of expertise to answer all his questions. This is where a job title can be fine and well, but what a person actually does, is another thing altogether. Now it is my son’s turn. He is a ‘Music Producer’. An ‘Audio Engineer’. Nowadays, (I know I sound old), there are even a post-secondary schools devoted to the study of this field. One of them happens to be located in our home town of Vancouver. As luck would have it, the stars have aligned and my son, not only knows what he wants to do with his life, after high school, he is already doing it and enjoys it immensely. We should all be so lucky. So what is an audio engineer? An audio engineer works with the technical aspects of sound during the processes of recording, mixing, and reproduction. Audio engineers often assist record producers and musicians to help give their work the sound they are hoping to achieve. The producer typically supervises the entire process from preproduction, through to the sound recording and mixing stages, and, in some cases, all the way to the audio mastering stage. The producer may perform these roles him or herself. It would be so much simpler to be a musician! Just like I used to say I was a designer. While the general public may identify with the most common type of creative jobs, like a singer or a designer, all those other parts need to be done as well. And those who are the most creative, will greatly enhance the overall finished project. 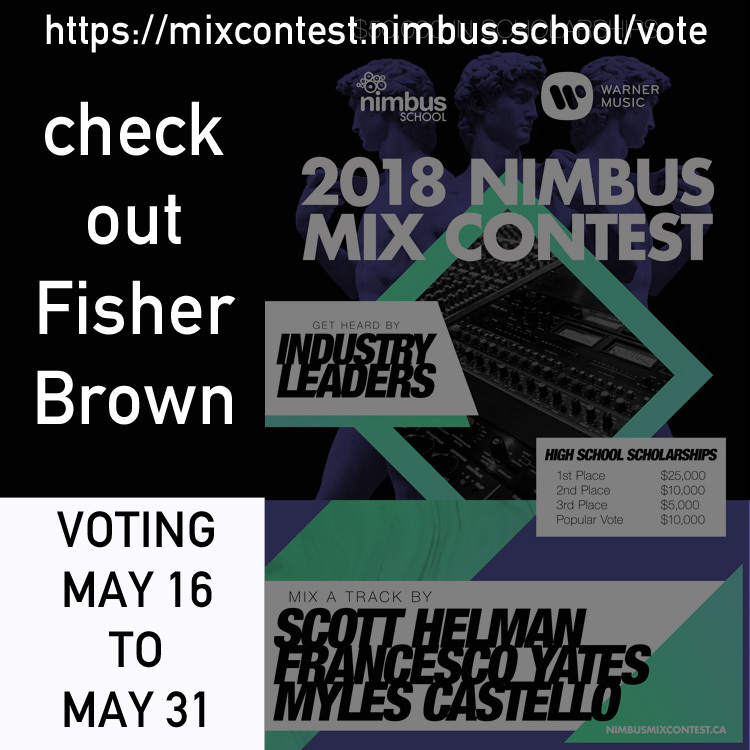 Now wander over to the world of an aspiring music producer….my son Fisher Brown has entered a scholarship contest put on by the school he wants to attend. The hard work of creating a new song has been done. Now it is time to vote! One of the compositions will get a chunk of the money based on popularity. Check out the link, sign in on social media and cast your vote! One vote per day from May 16 to May 31st. Share this link far and wide! Now you have a backstage look at the world of sound engineering!